The PERCH Interactive Template is a software structure that allows you to create apps for PERCH Units without coding. While certain parameters are fixed, the template allows for endless content-driven variation and creative expression. You can choose to work with the template yourself (Client Produced), or you can let PERCH integrate your content (PERCH Produced) - either way, the PERCH Interactive Template allows for quick and easy implementation and content updates. The PERCH Interactive Template has two modes: Attract Mode and Product Mode. The purpose of the Attract Mode is to attract the customer to the screen and provide a call-to-action. Once the customer picks up a product, the Product Mode is activated. Product Mode content is product-specific and can include anything from product stories and demonstrations to reviews, features, etc. The PERCH Interactive Template supports both portrait and landscape formats and can be used on all PERCH units. The PERCH Interactive Template works as a simple folder-based structure where content is dropped into folders and displayed in the app according to a hierarchy of layers. Each layer can contain either a video, an image, or a slideshow (i.e. image sequence). This ability to layer content creates endless opportunities for variation in content curation and display. 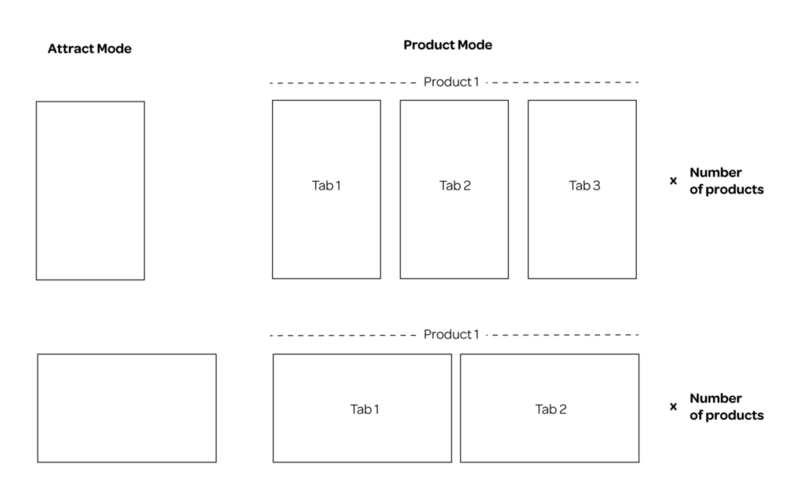 The diagram below shows the content structure for an app with 3 products and 3 tabs.